If you aren't already into park run, HIT or marathon training then make 2017 your year to start! I did my first 5km run in December dressed in a Santa suit at Belvoir Castle and was super happy with myself! I absolutely loved it! My new years resolution is to do a 5km run once a week, and instead of a Santa suit, I can't wait to wear the fabulous new active wear out on the High street! Fashion retailers are taking advantage of the massive fitness trend and launching their own active wear ranges. Gone are the days of boring black sportswear! I am super excited about the new active wear collaboration between Oasis and London's iconic Pineapple Studio! I might even feature some pieces in my catwalk show at the Rose Theatre, Kingston (26th Jan)! Ted Baker have a great new fitness range offering leggings, tops and jackets all in functional fabrics and their signature floral prints. Another great collaboration is Rosie Huntington Whiteley for Autograph - this has given the M&S sportswear offer a much needed revamp. 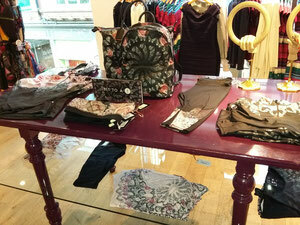 The range is full of unique designs in muted colours - great if you don't fancy standing out in graffiti prints and florals! New Look's range has grown massively and the offer is now extensive and so affordable. With my new fitness regime including running, tennis and yoga I was endlessly washing the minimal sports kit I owned. Finding such great stuff in New Look at amazing prices enabled me to get a whole new set for under £50!